© Provided by The Slate Group LLC Photo illustration by Slate. Photos by Getty Images Plus. Care and Feeding is Slate’s parenting advice column. In addition to our traditional advice, every Thursday we feature an assortment of teachers from across the country answering your education questions. Brandon Hersey, second grade, Washington. Could you explain the value teachers see in giving kindergartners’ homework? If I don’t make my child do it, will his teacher think I’m a terrible parent? Unfortunately, I can’t explain the value in assigning homework to elementary school students, because I don’t believe there is a value. Homework in its traditional sense (worksheets, book reports, or any activity that focuses on repetition more than enrichment) has been found to have little to no impact on academic success. There are several studies and articles on the subject, but I recommend The Battle Over Homework by Harris Cooper. The National Education Association based their position that K–2 students shouldn’t have more than 10–20 minutes a night largely on his findings, and many primary teachers now assign homework that can be done in 10 minutes or less. Plenty of K–5 teachers, veterans included, are moving away from assigning homework altogether. It can get a bit more complicated as students get older, since homework in high school—studying for exams, writing longer end-of-semester essays—is a different sort of beast. In our district, no teacher at any grade level (K–12) is allowed to include homework grades on report cards, which makes any homework that’s assigned encouraged, but optional. But every district is different. If your main concern is what your son’s teacher thinks of you, I’d have a conversation with them to get a better idea of their philosophy and expectations concerning homework. If your opinions don’t align, then let me be the one to say that I guarantee your kindergartner will by no means fall behind as a result of skipping homework, nor does it make you a terrible parent. My twin sons are in first grade. One of them is a people-pleaser with a touch of OCD, does his homework, has great handwriting, and is very careful about his work. The other is much more independent-minded, creative, and imaginative. He’s also less concerned with his homework, and his handwriting is quite messy. He intersperses capital and lowercase letters (he consistently writes capital A, E, N even in the middle of words). I’ve pointed this out, and he says that’s just how he likes to write some letters. Is this something that I need to make a bigger deal out of? Or is it a typical part of learning to write and spell, and he’ll age out of it? Both of your sons sound totally normal to me. First-graders are still learning how to use capital letters, and messy handwriting is typical among young writers. You’re in a unique position with two sons that are the same age, and one challenge you may face is the temptation to compare your twins to one another. These writing samples from Reading Rockets show the range of first-grade writing. Consider where your boys are in terms of developmental milestones rather than how one compares to the other. As the semester continues, if you’re still concerned about his writing, schedule a conference with his teacher to get her insight. But right now, I would just encourage his independent, imaginative mind by reading lots of good books and enjoying the creativity you see in his writing and storytelling. The capital letters will probably come in time. My son is a summer baby. His preschool teachers recommended we put him in one more year of preschool before starting kindergarten, so at age 5, we enrolled him in pre-K at the private school he’ll attend through eighth grade. Within a few weeks, the school stated that he was far too mature for the pre-K program, and it was causing problems. He was getting frustrated with the other children taking longer to complete exercises, and he was getting physical. They wanted to move him into kindergarten right away. I requested a social-emotional evaluation, and after it was completed, we moved him into kindergarten. All of this took about six weeks. The good news is that academically, he’s doing great! I never thought a kid would enjoy addition so much, and he’s picking up reading pretty quickly. Bad news is he’s miserable. He had bonded quickly and well with his prior teachers and classmates and now, even after being in his new class for longer than he was in his old class, he still misses it intensely and has decided that his new teacher is mean. He’s also not nearly as popular. Part of this is definitely his fault. He acts outside the norms of the class, and it upsets the other children. However, these norms were set at the beginning of the year, and he missed that. I’ve met his teacher. I’ve made it clear that I firmly believe we’re both on the same team, so she’s not the problem. I’ve tried everything from acknowledging the difficulty of change and missing his old friends and classmates to telling him that he needs to find a way to adjust his attitude so he can thrive. None of it is working. Do I just ride it out through June and hope first grade goes better? One complication: It’s a small private school ,and at least half the kids he’s with now will be with him through eighth grade. I’m sorry to hear about what you’re going through. Having a child who is on the younger side of things is tricky, especially at this age where every month seems to make such a big difference. But the fact that you and his teacher seem to be on the same page is a promising start. If you two are a team, you can problem-solve collaboratively. You say he “acts outside the norms of class.” Talk to his teacher about why she thinks this is happening, and when it’s happening: Is he not engaged at calendar time? Is he getting up and walking away from small-group instruction? Once you’ve identified what’s happening, you can work with the teacher to motivate him to change that behavior. Often, the fundamental norms and skills expected of a kindergartner are taught in preschool, so he may simply not know how to behave, or have the academic stamina to maintain those norms. In these cases, a special incentive to follow these new expectations may make a huge difference. For example, a special job is a powerful tool. It may seem counterintuitive, but sometimes the most challenging kids are the best for special jobs because it gives them something to focus on and work toward. If he is the calendar helper at circle time, or the line caboose who turns the lights off during a transition out of the classroom, the responsibility itself may motivate him to stay in line—literally! Sticker charts or gameboards also work well. Give him a reason to want to follow the rules beyond the social consequence piece, which is a little abstract for a kindergartner. As far as his maturity goes, you may just need to wait it out; he’s still little. Next year, he will be 125 percent of his current age. And, likewise, he’s a lot younger than some of his peers. It might help for your son befriend a kind peer who can help him out. Childhood friendships are, to a large degree, born out of opportunity, so if you, his teacher, and perhaps another parent can conspire to set him up with another child, over time, that child can begin including him in social situations, which will help him along and close some of that age gap. This is why lots of schools have “buddy” systems for new kids—it gives them someone who can help them make friends until they’re ready to do it on their own. I realize there’s no obvious, easy solution here, but try to focus on how amazing it is that he’s doing well academically. He may just need time to learn to make friends with these older kids. 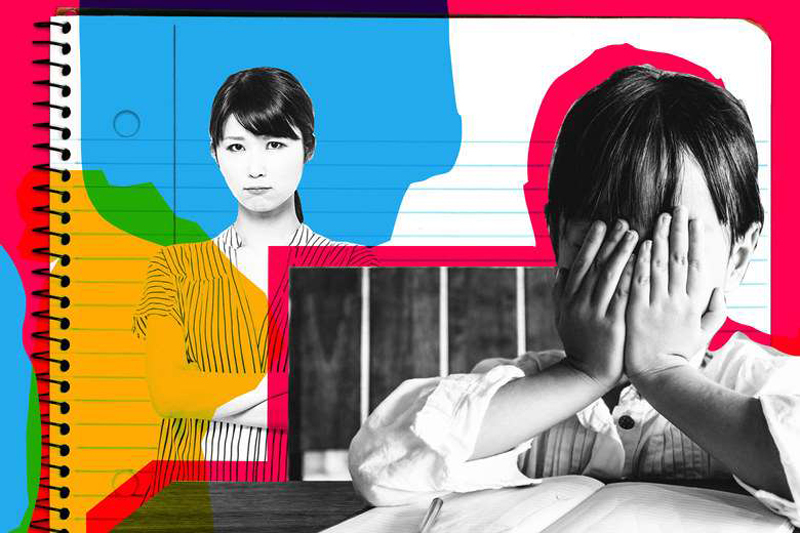 The fact that he’s struggling behaviorally in class doesn’t help with the social piece, but eventually, the other kids will get over that, too. Stay in close touch with his teacher, and remember that he will need support in order to “catch up,” but ultimately, he will probably figure it out. What’s the best way to support a child who’s above grade level in a specific subject, like math, for example? My son is in second grade, and we’re trying to figure out what instruction he should be receiving at his public school. Our school is great in some areas, but math is not one of them. You can support your son in honing his math skills in many ways. First, make sure you have a clear understanding of the Common Core state standards for your school, so that before you add anything to your son’s load, you’re certain he’s mastered most standards for his grade. You should be able to find this out on your school’s county or district website (if not, call your school’s secretary, who should be able to direct you to the appropriate resources). Once you’re confident he’s showing mastery in the necessary areas, I’d have a conversation with his teacher. You’ll want to make sure that whatever supplemental instruction you choose aligns somewhat with what he’s learning in school. In math especially, different curriculums utilize different strategies to solve problems. Well-meaning parents and tutors often teach kids the standard algorithm (borrowing and carrying) before a teacher has laid the appropriate foundations of number sense. Talking with his teacher will give you a better sense of how to forge ahead. Whatever route you choose, it sounds like with some support from you, your son will continue to show great growth in math! U.S. Daily News: Ask a Teacher: Does My Kindergartner Really Need to Do Her Homework?